The Garrett ACE 200i is the baby of the newish ACE series of metal detectors and ultimately the cheapest out of the 3. The line was released in 2016 and has proven to be as popular as Garrett’s initial ACE range. Garrett had much success with the predecessor ACE line so they went ahead and released a whole new line that have been upgraded to keep up with the times. The 200i metal detector targets beginners and teenagers I believe and is 2018’s answer to the Garrett ACE 150. Keeping the same design as it’s predecessors the Garrett ACE 200i is the same bright yellow and black as before. In actual fact nothing has really changed other than the addition of “camlocks” these are locks that click in place to increase the stability of the stem. There is a comfortable sponge padding around the part of the stem which you grip, and the forearm cup also has padding for extra comfort. The control panel remains very simple with only 3 large buttons and a very basic amount of data on the screen. Ensuring that a beginner will find the ACE 200i very easy to navigate. 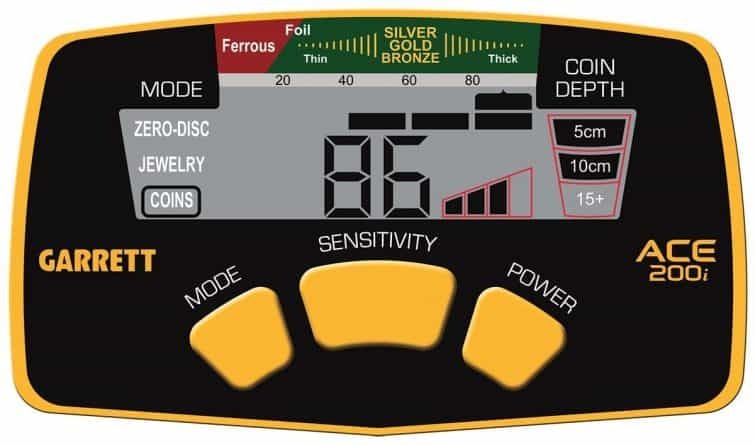 The LCD display shows the mode you have the detector set in, a ferrous and non-ferrous scale, sensitivity level, estimated depth level and the new and improved numeric target ID. The stem is fully adjustable to suit different height requirements and clicks into place with the little silver button thingys! You can then secure this with the new camlocks by screwing them in place. You can adjust the stem from 40″ to 53″. As standard, the Garrett ACE 200i is fitted with a 16.5 x 23cm (6.5″ x 9″) PROformanc submersible search coil. 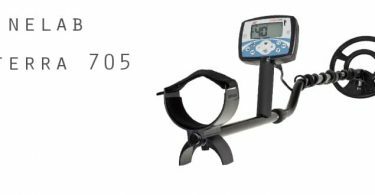 It’s a very lightweight metal detector weighing in at just 2.75 pounds or 1.2 kg. Although I’m really not a fan of the yellow colour (I went as far as having my EuroAce resprayed) the build quality of the Garrett ACE range has always in my opinion been very good. I think they look like they are built cheaply because of the yellow colour. They really aren’t though, always been very sturdy and durable. My EuroAce took a battering over the years and still never failed me. Keeping it simple, and when I say simple I mean really simple. There are a very limited number of modes or features included with the ACE 200i, but then if you are a beginner or someone who just wants to go out and detect then it’s not a bad thing. No big fat manual to read through, no panicking you’re doing something wrong. Just pretty much switch on the Garrett Ace 200i and off you go! Zero-disc – this is all metal mode which means no discrimination against ferrous metals. You will receive signals and beeps for any metal found in the ground whatever it is. Jewellery Mode – No this doesn’t mean that you will only find jewellery it means it’s been optimised to discriminate against most junk items and focus on metal materials like bronze, silver, gold, brass, copper etc. Coins Mode – Again this doesn’t mean you will only find coins, it just means that when they created it they optimised this mode for coin hunting. It will discriminate against things like foil and iron. Reducing the amount of junk you dig. That’s it for the modes nice and simple and very straightforward allowing you to select your preference and get straight into it. There’s a sensitivity setting on the ACE 200i allowing you to increase or decrease the sensitivity. The simplest way to explain this is if you’re on good ground with no mineralisation you can crank the sensitivity up to the maximum this will increase your depth capabilities, however, if you’re on bad ground the sensitivity on too high will cause the metal detector to become unstable and create false signals. So on highly mineralised soils, you should decrease the sensitivity until the ACE 200i is stable. Numeric Target ID, a welcomed addition to the new ACE line of metal detectors. The numeric target ID is a display on the control panel of numbers 0-99, these numbers give you more detailed information on what metal the target is made up of that is located in the ground. Submersible Coil, this means that the coil can be submerged in a little water. This does not mean that the metal detector is fully waterproof. 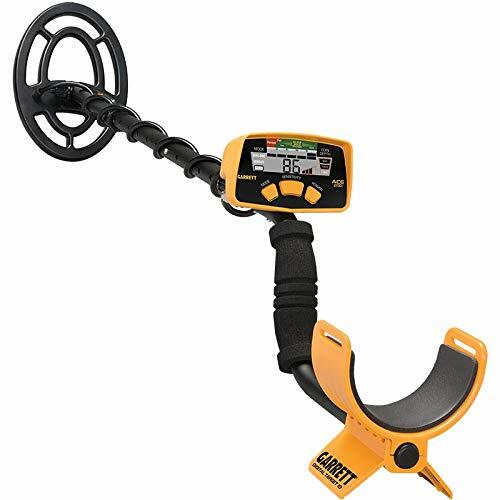 One of the cheapest entry level metal detectors on the market you can pick up a Garrett ACE 200i metal detector without breaking the bank. Check the current price below. I didn’t get to have much time using the ACE 200i but I did get to have a swing! If you’re a complete beginner or teenager with a smaller budget then the Garrett ACE 200i is a good entry level metal detector to introduce you to the hobby. The minimal amount of buttons and features will allow you to switch on and go without any complications. 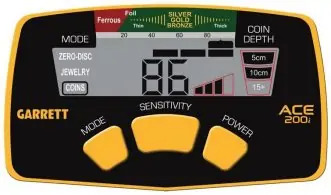 Garrett has built a reputation in the metal detecting world and they are a brand you can trust with thousands of users who swear by their machines. Performance is not so great on the wet sand, so if beach metal detecting is what you have in mind, you will be limited to the dry sand. It also doesn’t perform fantastically on highly mineralised soils, that being said no beginners metal detector does in these conditions. Fairly lightweight so while you’re building up your detecting muscles the Garrett ACE 200i won’t put too much strain on you and in my opinion is light enough to swing all day long. The main thing you need to know is it does work and it will find artefacts and coins if they are in the ground. It has a depth capability of around 6 inches, sometimes more if you’re hunting on good ground conditions. The Numeric Target ID is probably the best addition in comparison to the older version the ACE 150. The numeric target ID gives you a numeric readout while over the target which allows you to determine whether the target is worth digging. It works fairly well! Especially on the coins. The numbers stayed very stable. 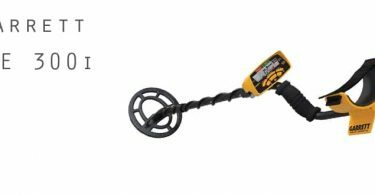 To summarise if your budget will stretch a little more then I would opt for the ACE 300i or the 400i if not then the ACE 200i is perfectly fine for your first metal detector. I’d get yourself some headphones if you do purchase one, the Garrett ACE models are known for being pretty noisy, the headphones will also allow you to hear more tone information, thus giving you more details on the target you have located. Length Adjustable 40" - 53"
What are the best settings for the Garrett ACE 200i? Select the zero disc mode (all metal), set the sensitivity one from the top (or top if ground conditions are good) and away you go. Setting the ACE 200i to all metal mode will ensure you do not miss a signal. Keep an eye on the numeric target ID and listen for the tones. Can you upgrade the coil on the Garrett ACE 200i? Yes you most certainly can there are numerous coil upgrades available for the Garrett ACE 200i, coil upgrades will increase the performance of the metal detector in different ways depending on the coil you choose. What kind of depth can the Garrett ACE 200i achieve? From research and in my opinion the Garrett ACE 200i hits around 6 inches but can easily go deeper if the conditions of the ground are good. The Garrett ACE 200i was an up to date model of the Garrett ACE 150 so it’s to my understanding that the Garrett ACE 250 is probably a little more powerful, the 250 also features a pinpoint mode and more modes. The only thing that I would say is better about the ACE 200i is the numeric target ID.